PC Howard offers a product reworking service as part of our complete third party logistics solutions for UK and overseas customers. An overseas based business is looking to distribute products throughout the UK which are shipped to third party logistics provider in bulk. Their UK clients have different packaging requirements and therefore the products need to be reworked before they are shipped to their destination. 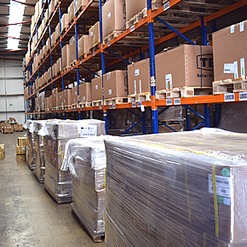 With dedicated systems and three main distribution warehouses to choose from, we have considerable experience in reworking products for re-distribution. As part of our services we can also offer a customised solution for your business. We will work with you and utilise our expertise to formulate a logistics plan effectively store and transport your goods.